Want to set your intentions, wishes and help create your desires for 2017 and 2018 but in a fun, creative way? This resourceful afternoon is a inspiring and focussed way to look at your year ahead and the life you would like to realise in the next twelve months. The session will start with a meditative journey to set new intentions and plans, followed by a supportive and informal group involving collage and visualisation to generate your most fulfilling way forward. * Set and prioritise goals, values, and intentions. * Seeing a vision board regularly—with images and words representing your goals, wishes, and values—helps remind you of what you want to do, be, and have. * Ensure that you move towards these goals, both consciously and unconsciously. At the end of the afternoon, you will leave have a bespoke, inspiring and original vision board to display in your home and refer to regularly, as well as a clearer sense of the way forward for you into 2018. At the end of the afternoon, you will leave have a bespoke, inspiring and original vision board to display in your home and refer to regularly, as well as a clearer sense of the way forward for you into the year ahead. £25 for the afternoon – All materials provided along with resources, materials, nibbles and refreshments. There is only space in the venue for 8-10 people so book your place soon! Strike a Light is a Brighton and Hove based arts and heritage organisation which focuses on people’s life stories and local memories to engage a wide range of groups and individuals in creative and heritage activities, encouraging engagement and outreach as well as involving memories and archive material and workshops; making art to transform public and private spaces. As a skilled and professional organisation with a team of independent associates, we offer a varied team to deliver projects, activities and support for heritage venues, arts organisations, archives, educational settings and local authorities. We’ve got a couple of spaces left on this lovely creative course looking at making a life history book for those with Dementia or if you work in social care and are looking for new ways to engage clients and residents. The course starts on 6th April and runs every Thursday in April. Strike a Light – Arts & Heritage will deliver a series of four workshops to learn how to create a life history booklet for a family member’s life. Workshop dates are: Thursdays 6th, 13th, 20th & 27th April 10am-1pm. These take place at the Strike a Light studio in Brighton. A life history book may be something that visitors can look through with a person, or it can be referred to by professionals to learn more about the person they are providing care for. The cost is £100 (£80 concession) for the four week course from 10am-1pm each week. The course will include the work book, resources, planning, materials and refreshments, as well as interim support and suggestions if needed. We’ll be delivering free drop in Diwali themed activities for Nutkhut’s Dr Blighty project at this family day at the Brighton Dome on Sunday 30th October. A free all day, family celebration, taking place in Brighton Dome and Brighton Museum. Join in this annual all-day celebration of local arts and heritage. With a multitude of free children’s activities including face painting, an all- day crafts area and story-telling by Banyan Tree Theatre Group. Enjoy pop up singing and talks, a Zumba workshop & an opening ceremony drumming procession. Plus music from African Night Fever DJ & DJ Task. Have your head wrapped in the latest styles, design and print and own your own tote bag, then learn to dance Azonto – and of course, don’t leave without tasting something delicious from the food stalls from Africa and Asia. Part of the weekend-long programme Africa Arts Festival at Brighton Museum. A creatively curated drop-in daytime event, with free workshops, exhibitions, talks, and cafe. We’ll be hosting songstrels The Close Shaves, creative workshops from artist Fiona Edwards, tea and cakes, WWI era bicycles from the Royal Sussex Cycling Battalion, exhibitions from Gateways to the First World War on cinema and theatre, and also from Royal Pavilion and Museums Brighton and Hove. The event taking place is part of national Heritage Open Days events. During this special drop-in event, Fabrica opens its doors to the public for an afternoon of stimulating and engaging activities and exhibits. Dr Geoffrey Mead will lead an early evening tour for The Boys on the Plaque project, looking at the stories from soldiers on a WWI memorial plaque (based at Fabrica gallery), who with connections to this area of the city. The tour runs from 6-7.30pm and starts from Fabrica gallery, 40 Duke Street, Brighton BN1 1AG. The event is free but booking is necessary here. An exhibition specially for Heritage Open Days which focuses on the history of brewing in Lewes, East Sussex and its related industrial and agricultural links from the 18th Century to the present day, a period of some 200 years. The exhibition looks at working life in relation to Breweries, agricultural workers and rural life and trades. A project in partnership with Harveys Brewery. Strike a Light showcases its WWI themed project The Orange Lilies – Brighton and Hove Soldiers in the Somme. The project focuses the city’s legacy of the Somme and a significant event on the eve of this (where huge numbers of Brighton soldiers fell), The Battle of Boar’s Head (also known as The Day that Sussex Died), as a key part of WWI, and its subsequent impact on Brighton. Fabrica gallery, Gateways to the First World War project, and Brighton and Hove Libraries and Information Service. These are funded by the Heritage Lottery Fund. Our free Heritage Open Days events taking place in 2016 will be at Fabrica on Thursday 8th September from 1-4pm. A WWI historic walking tour will also take place on Friday 9th September, which will be led by historian Dr Geoffrey Mead (donations welcome). Join us for this special drop-in event, to explore and contribute to our local heritage project, The Boys on the Plaque! Find out about remarkable young men who lived in our city and fought in the war 100 years ago, and the discoveries we’ve made about their experiences, families and legacies. Keep the Home Fires Burning brings together local research, creative workshops and exhibitions, heritage activities and screenings to explore personal memories of Brighton & Hove residents during WWI wartime and the stories that have been left behind for us to rediscover. Fabrica is a contemporary art gallery housed in the former Holy Trinity Church in Brighton, which was built in 1817 and has a rich and fascinating history. To celebrate Heritage Open Days, Fabrica will open it’s doors to the public for an afternoon of stimulating and engaging activities and exhibits to discover more about our local community, inspiring new ways of considering the home front experience of the Great War. Visitors are also invited to bring their own stories and keepsakes to share with volunteers and staff and contribute to our research project, which seeks to uncover the history of each of 95 local soldiers who are commemorated in the church. Wheelchair ramp built into entrance. Guide dogs welcome. Accessible toilets on site. Accessible parking space (1) in front of building. Keep the Home Fires Burning is a relaxed free drop-in activity. All ages are welcome. Free hot and soft drinks are available throughout, as well as cakes. Guests are invited to relax and chat whilst enjoying the event and activities. This event will look at the home front of Brighton during WWI with film, song, creative workshops, exhibition, performance and research related to the local history and cultural memory of the city. These are all part of our The Boys on the Plaque WWI project funded by the Heritage Lottery Fund. Led by local historian Dr Geoffrey Mead, this will be a unique Walking Tour of Brighton’s historic The Lanes and North Laine area. Exploring the stories of local soldiers that we have discovered as part of a local heritage project, we get to know the young men who lived in these streets over 100 years ago, before joining a war that took them far from home. Inspired by a selection of stories from local soldiers commemorated on a memorial plaque at the Holy Trinity Church, the tour will begin at Fabrica art gallery. The tour will last 60-90 minutes and will take place on the streets of Brighton – sensible shoes and attire recommended. Event not suitable for children under the age of 12. Free to join, donations welcomed. Event not suitable for children under the age of 12. The Boys on the Plaque – Heritage Open Days a success! We celebrated the launch of our WWI heritage project this month with our first public events as part of Heritage Open Days. This was a free afternoon of activities, events and talks which was a great opportunity to get the word out about our Boys, followed by a walking tour event on Friday 8th September at Fabrica gallery (our project partners), where we invited local people to come and see the plaque and share their stories. 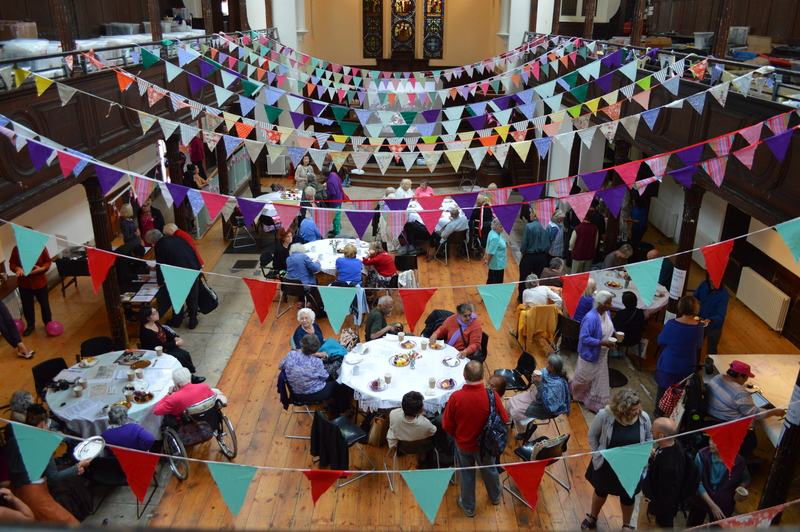 We have a diverse and interesting afternoon of making WWI love token mementos, talks on Brighton and Hove during the Great War and about the Royal Pavilion as a hospital for soldiers, as well as sharing personal and community connections with the Holy Trinity church where Fabrica is now based. We were treated to a fascinating talk from researcher and oral historian for ‘War Stories: Voices of the First World War’, Jo Palache, plus an illuminating insight into The First World War in East Sussex project with Chris Kempshall. Gateways to the First World War‘s Lucy Noakes came to share project experiences and history and showcased part of a wider exhibition concerning WWI. Project partner Brighton & Hove City Libraries shared WWI resources and images from their collection and encouraged people to find out more from their Ancestry software about their own personal heritage. In addition. Fiona Edwards our workshop artist for the event brought along a beautiful bundle of arts and crafts and encouraged participants to make beautiful WWI keepsakes inspired love tokens from the war. The project’s Volunteer Research Group was on hand to share their findings so far on the memorial and its’ Boys on the Plaque, including some family connections to our soldiers which really brought our project to life. The Boys on the Plaque represent so many of the sons, brothers, fathers and uncles who fought and fell in the First World War, and this project will pay tribute to these men by telling their stories and considering the wider impact on the local community. In 2017 it will be the Bi-Centennial of the Fabrica building, which was built in 1817, and it will be a fitting time to honour and celebrate the history of the building and its continuing presence as a place of contemplation and community in Brighton & Hove. We hosted a free heritage walking tour the following day led by popular local historian Dr Geoffrey Mead. We took an interested group through Brighton’s Lanes area, from where many of our Boys on the Plaque lived. It was a really moving and enlightening experience, seeing buildings and venues in a whole new light and hearing the tales of residents past who went to war. We even saw a hidden row of houses which despite having walked down that particular street many hundreds of times, have never noticed! The event was full booked and as a result, Fabrica organised another tour for later in September to allow all those interested a chance to participate. We’re really pleased with how it went. For those interested in find out more about this project and these themes from WWI in the city of Brighton, then we will be running free, monthly Conversation Cafes every month from October 2015 – September 2016 at Fabrica gallery and Jubilee Library. To register your interest, please email strikealight@rocketmail.com before 21st October. Excited to see that the research group from our The Boys on the Plaque project with Fabrica gallery is yielding lots of new leads about our soldiers from WWI. Since the launch of the project, we have made real progress in the couple of months since we started. We now have a great group of volunteer researchers that are hard on the case of investigating the 95 soldiers names that are on the plaque. 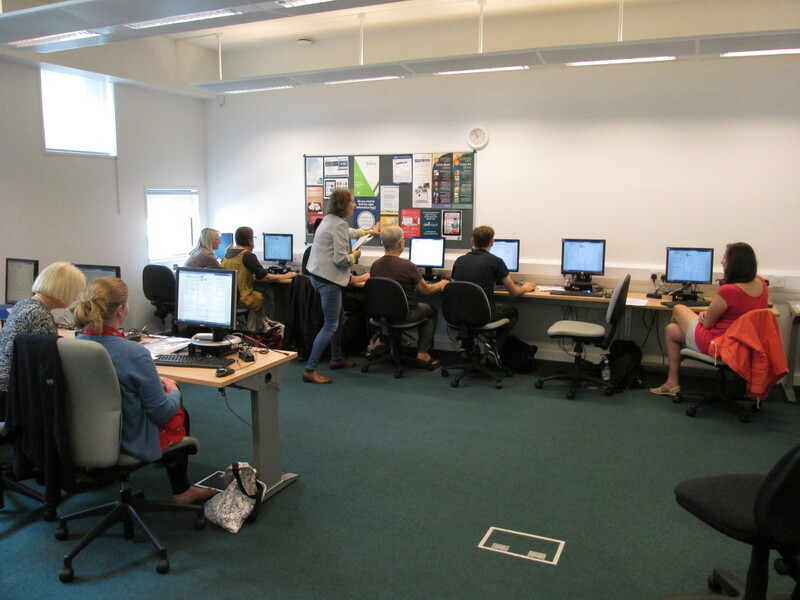 Our first training session took place this month at Jubilee Library where we learnt how to log on to the computers, use websites such as Ancestery.com, Findmypast, the British Newspaper Archive and many more. During this tutorial run by Brighton and Hove Library service, we also learnt how to deal with difficult or similar names, missing documents, confusing handwriting and the most annoying misspelt names. So far we have uncovered some really interesting discovers about our boys. Robert Filtness, Brighton-born, lived in 63 North St before the war, was a ‘Political Speaker’ for the Tariff Reform League. His brother Walter H Filtness was an optician who served in the RAMC and spent 3 months as a patient in the Royal Pavilion Hospital towards the end of the war with typhoid. Cpl Arthur John King (4 Feb 1895 – 15 July 1916) Arthur was enlisted as a private to the 6th (Cyclist) Battalion, Royal Sussex Regt (regimental no. 177) but died of accidentally drowning off the Kent coast. Robert Winter Tilney and Eric Gordon Tilney, two brother who where privates that survived the war. There father ran a stationery shop on Ship Street, Brighton. This then passed down to Robert and to his children. This stationery shop is still in family hands and exist in West Worthing. 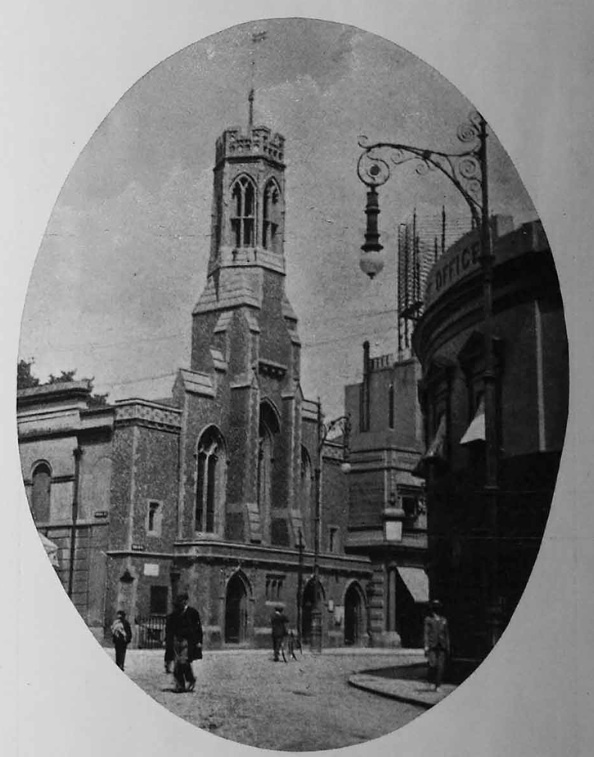 On Thursday September 10th 1pm – 4pm we are holding a Heritage Open Day at Fabrica Gallery(Holy Trinity church), me and some of the research volunteers will have a stall where we can share information and answer questions, so please stop by. We have lots more information that we have found, we are just in the motion of digesting it all. You can keep a track on our progress here, where we will be posting updates, more in depth research into individual soldiers and information about our research team. I look forward to hearing from you and please do not hesitate to get in touch if you have any information about one of our boys on the plaque. Throughout the project, our Volunteer Research Group will be looking into the history of each of The Boys on the Plaque. If you have some information about The Boys on the Plaque that you think might help the group, don’t hesitate to contact us on boysontheplaque@fabrica.org.uk or leave a public reply at the bottom of the page. We will be celebrating Heritage Open Days this September with a trio of exciting events to share and discover The Boys on the Plaque. During this special drop-in event, Fabrica (previously the Holy Trinity Church) will open it’s doors to the public for an afternoon of stimulating and engaging activities and exhibits to inspire new ways of considering our communities experience of the war. This free event will include creative workshops, heritage activities and screenings to explore personal memories relating to the war and the stories we were left with. Guest speakers will include researcher and oral historian for ‘War Stories: Voices of the First World War’ Jo Palache, and Dr Chris Kempshall, Project Officer – First World War Commemorations in East Sussex. Visitors are invited to bring their own stories and keepsakes to share with volunteers and staff and contribute to our research project, which seeks to uncover the history of each of The Boys on the Plaque, as well as discovering the wider story of Brighton & Hove during WWI. A free afternoon tea, music and a warm welcome to people of all ages will be provided! 6pm, Friday 11th September 2015. Free to join, donations welcomed. This will be a unique, one-off Walking Tour of Brighton’s historic Lanes, exploring the history and changing social and architectural landscape of this area of the city in relation to the period of time around WWI. The tour is inspired by a selection of the stories from our discoveries about the local soldiers commemorated on the memorial plaque at the former Holy Trinity Church, which now houses Fabrica art gallery. Beginning at Fabrica, the tour will last 60-90 minutes and will take place on the streets of Brighton – sensible shoes and attire recommended. We’re really pleased to hear that there will be an exhibition of renowned outsider artist Nek Chand this summer at the Pallant House Gallery in Chichester. Some of us at Strike a Light worked with this inspiring man in a month long residency creating an exterior mosaic mural from scratch at The Rock Garden in Chandigarh, India some years ago and found it an illuminating and magical experience. This summer Pallant House Gallery is delighted to announce an installation of sculptures by renowned Indian Outsider artist Nek Chand, creator of the famous sculpture park The Rock Garden of Chandigarh, India. The figurative mosaic works will be on display in the Courtyard Garden, which was designed by award-winning garden designer Christopher Bradley-Hole, and in the Garden Gallery, from 13 June – 25 October 2015. Born in 1924 in the village of Berian Kala, in what is now Pakistan, Chand relocated to India with his family in 1947. Eventually, he moved to Chandigarh in the northern part of the country; the first planned ‘utopian’ city in Post-Independence India, designed by Swiss architect Le Corbusier. Nek Chand is a deeply spiritual man, fascinated by the mystical significance of rocks, who was by profession a public roads inspector. However, he began spending his evenings imagining and moulding figures out of recycled and found materials. Pursuing a vision from a dream, Chand cut back a clearing in the jungle on the outskirts of Chandigarh, situated in the middle of the Capitol Complex and the Sukhna Lake; the place where his Rock Garden was to come to life. This space, he believed, had once been home to a glorious kingdom. His process is indicative of many historically renowned Outsider artists, with a focus on found objects and recycled materials. Chand uses discarded objects, such as broken crockery, electrical fittings, glass bangles and bicycle frames, building up the bulk of the figure with cement and sand mix. A final coating of smoothly burnished pure cement combined with waste materials would then be added. Chand believed that each figure contained the spirit of a human being, god or goddess. In 1972, the Rock Garden – originally an illegal endeavour by Chand in his spare time – became a municipal authority-funded tour de force. Stunned by Chand’s creation, the authorities pumped money and labourers into the project; which is now the world’s largest visionary environment, with several thousand sculptures covering more than 25-acres. In 1976, it was opened to the public. Although the public’s reception to the Rock Garden has been undoubtedly positive, the park was vandalised in 1996 whilst Chand was visiting the United States. The damage has since been rectified, with the incident resulting in the created of the Nek Chand Foundation in 1997. The Foundation aimed to protect and promote the park internationally. Today, the Rock Garden is overseen by the Rock Garden Society, and opens its doors to over 5,000 visitors every day. In a country known for the slums that grow out of its waste, the Rock Garden is an example of one man’s unrivalled intuitive vision. Chand’s fascination with the creation of something from nothing; the conversion of waste into beauty, has resulted in one of the largest tourist attractions in the whole of India, second only to the Taj Mahal. Nek Chand’s work has since been included in the Hayward Gallery’s 2013 exhibition ‘Alternative Guide to the Universe’, the exhibition ‘Raw Vision: 25 Years of Art Brut’ at the Halle Saint Pierre museum in Paris, as well as the Museum of Everything’s inaugural exhibition in Primrose Hill. The exhibition of Chand’s work reflects the ethos of Outside In; the Gallery’s flagship project providing a platform for artists who define themselves as facing barriers to the art world due to health, disability, social circumstance or isolation. Although Outside In does not explicitly focus on Outsider Art, Chand’s self-taught process and dedication to his project resonates with many of the 2,000 artists represented on the project’s website. The exhibition will include a selection of sculptures from the Nek Chand Foundation and will be in the Courtyard Garden and Garden Gallery at Pallant House Gallery, Chichester, from 13 June – 25 October 2015.